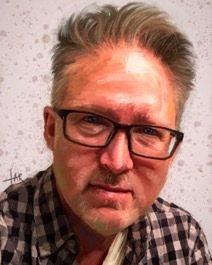 Growing up primarily in the Southeastern United States, and graduating from high school in Southern California, Tim has always had an enthusiasm for drawing and painting. He entered numerous art competitions during his teen years and consistently placed in the top five. After graduating from The Art Institute of Atlanta with a degree in Visual Communications, he began his career as a multimedia designer and graphic designer for print and was on the cutting edge of web design from the beginning stages of the internet. While at The Art Institute, he honed his skills in realistic portraits and painting, but his fast-track creative design and web career, along with raising three children, allowed little time for drawing or painting. He soon became a highly successful designer and art director for several international design agencies, winning several national and international awards. After nearly 30 years as a graphic designer, he began revisiting his first love of drawing and painting and has refocused his energies on large paintings, photo-realistic graphite work and an exploration of spontaneous realism.